A properly engineered and designed sound system is vital to a successful sound system project. And hiring the right systems contractor is the key to getting a properly designed sound system. 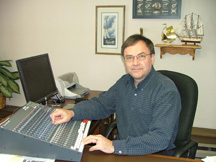 Ron Huisinga and David Honken combined have more than 50 years of experience engineering sound systems for churches. They use the latest technology to engineer the proper sound system that works in your church or school and satisfies your unique needs. The design phase involves the use of computer modeling with EASE. Computer modeling can produce accurate productions of how the system will provide coverage to the seating areas. But it works only as good as the information that is inputted into the model. that is what our years of practical experience bring to the table. We have installed hundreds of systems and that experience is vital to be sure of our guarantee. You must be satisfied or we will remove the system with no cost.